The belfry of Bruges, among the locals known as “de Halletoren“, is situated at the Grote Markt (Market Square). The tower is 83 meters tall and leans slightly to the left. Around 366 steps lead you through various intermediate stops all the way up the tower top where you are treated to a stunning 360* panoramic view. 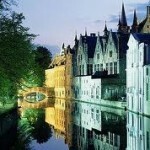 The Belfry of Bruges is simply a must for anyone visiting the city. A little effort with a great reward! At the site of the present belfry of Bruges there were originally a number of halls, but from 1240 a belfry of stone was built, with a wooden striker (now gone) on top. The halls of the Belfry of Bruges were used as covered markets mainly for the thriving wool and cloth trade. The tower itself had a more administrative role: both the City Treasury and the archives of the municipal accounts were located on the first floor. Furthermore, the tower itself had a primary role as a watchtower for discovering fires in the city. When in 1280 a fire burned down part of the tower and the archives from before that time were lost, they went on to build a separate hall on the adjacent Burg square. 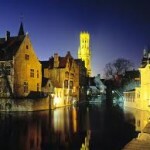 Most administrative functions then quickly left the Belfry of Bruges. In the period 1291-1296 the tower was again restored with two lower components and a square wooden spire. 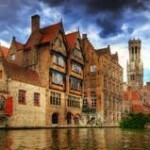 In the 16th century a gallery was built behind the Halls of the Belfry of Bruges. The rectangular courtyard got some galleries on the first floor. 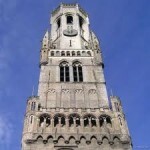 In the early 19th century the tower of the Belfry of Bruges received the current neo-Gothic crown instead of the former wooden spire. The halls at the foot of the tower of the Belfry of Bruges initially had a essentially commercial function. There were several rooms where every variety of craft products was sold, with city approval. The second floor of the Belfry of Bruges housed the treasury and the city archives (see above). The financial statements from 1281 are almost all preserved, before 1300 in Latin, after in the vernacular, the local dialect. The balcony above the entrance was where ‘bailiffs’ in the 14th century proclamed the so called Hall Commandments announcements to anyone who would listen. They mostly concerned the rules regarding public policy and trade and industry. Later, from 1769, these “commandments” signs were pasted on announcement on the town hall. But the name Hall Commandments remained. Before the 16th century, the bells from the Belfry of Bruges were played by hand for things like opening and closing of the city the gates, the beginning and end of work hours, festive bells, etc. After the fire of 1741 which seriously affected the Belfry of Bruges there were still 47 carillon bells, which together account for about 30 tons. These are still in use but are only played manually on special occasions.